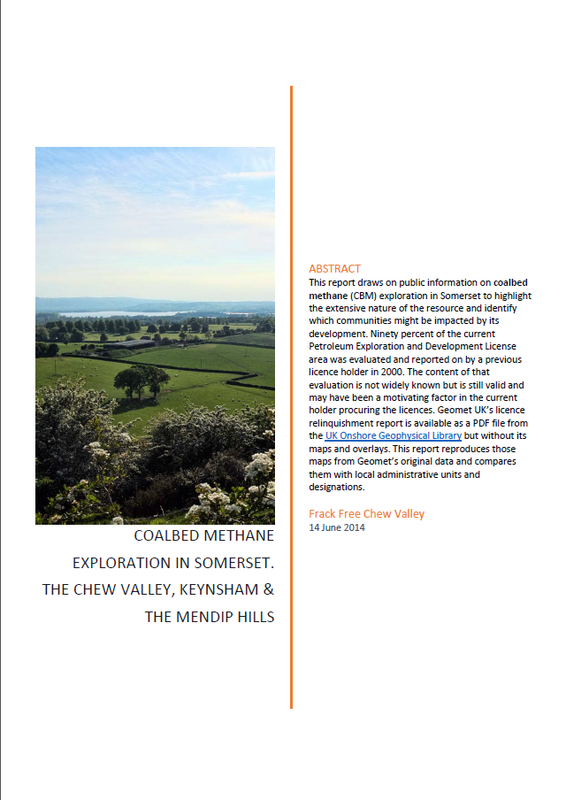 UK Methane Ltd are not the first company to be interested in the potential of coalbed methane (CBM) in Somerset, GeoMet UK Ltd / GeoMet Inc held PEDL 074 in the late 1990s and submitted a licence relinquishment report to the government in 1999. This report assesses the coalbed methane resource in Somerset in terms of its volume and location. The report has been difficult to locate and is missing its maps and figures but we have also located the original digital files in the National Archive and have recreated them. GeoMet Inc are coalbed methane consultants and amongst other things they helped develop the Blue Creek field in the Black Warrior River basin in Alabama USA, they also developed the adjacent White Oak Creek as their own project. So they know what they are talking about. The satellite image below is what a 20 km by 20 km block of White Oak Creek looked like in 1985 before coalbed methane development got started. White Oak Creek, Alabama USA, 1985. Black Warrior River is in the bottom right. White areas have been recently logged. 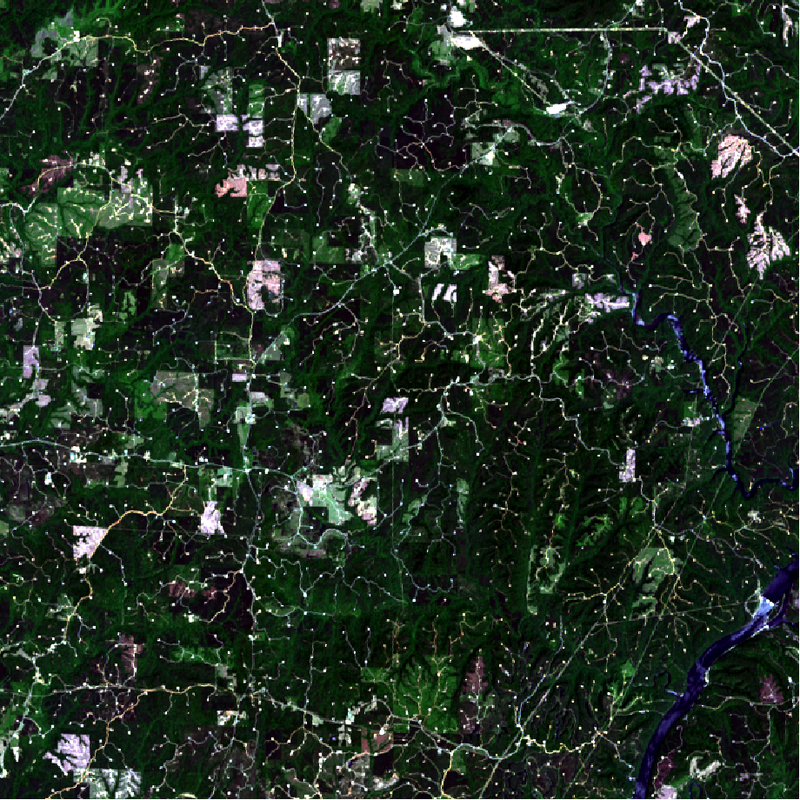 True colour Landsat 5, 021-037, 11th October 1984. Click to enlarge. This is what the same area looks like almost exactly 30 years later in 2014, it is literally covered with more than one thousand CBM gas wells and hundreds of km of access roads and pipelines. White Oak Creek, Alabama USA, 2014. 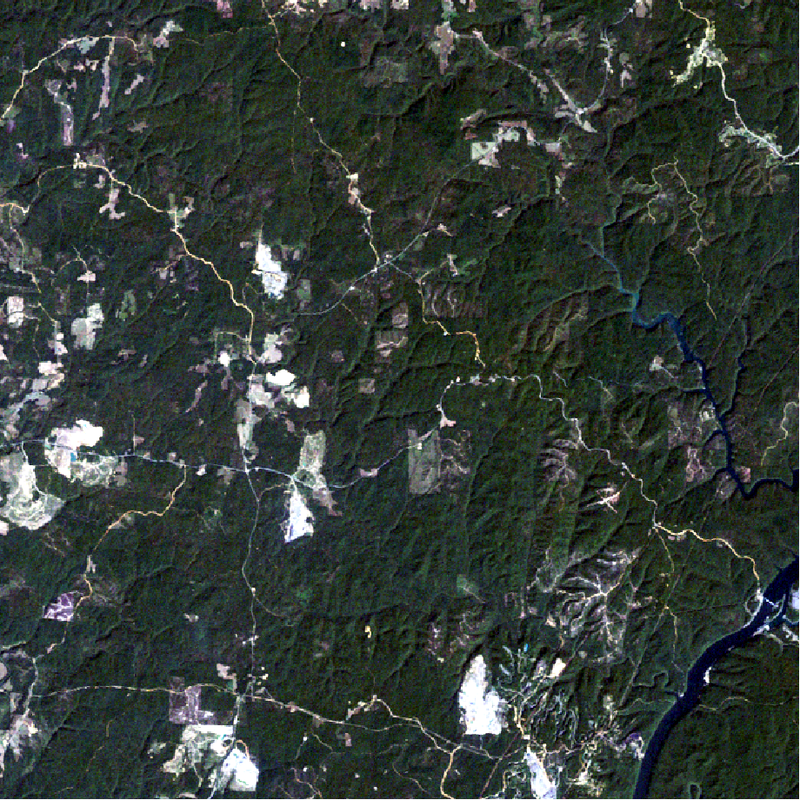 True colour Landsat 8, 021-037, 20th May 2014. Click to enlarge. Of the many issues impacting on the Black Warrior River the citizen based non-profit organisation Black Warrior RIVERKEEPER documents CBM impacts on the catchment and provides a Google Maps link. PEDL074 GeoMet’s licence area in 1999. 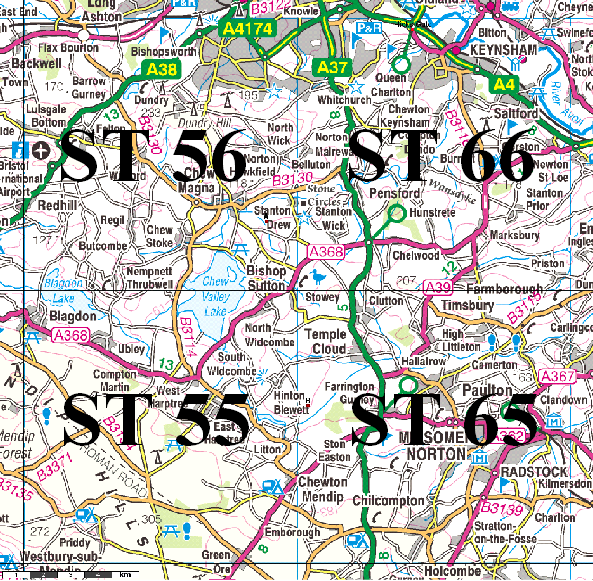 Contains Ordnance Survey Open OS data, copyright OS. The coal measures are the geologic strata containing coal seams and consist of the upper, middle and lower coal measures. Having started as horizontal sedimentary layers they have been contorted over geological time to form a distorted basin to the south of Bristol. The edge of the basin comes up to the surface in places and descends to 9,000 feet in the middle. 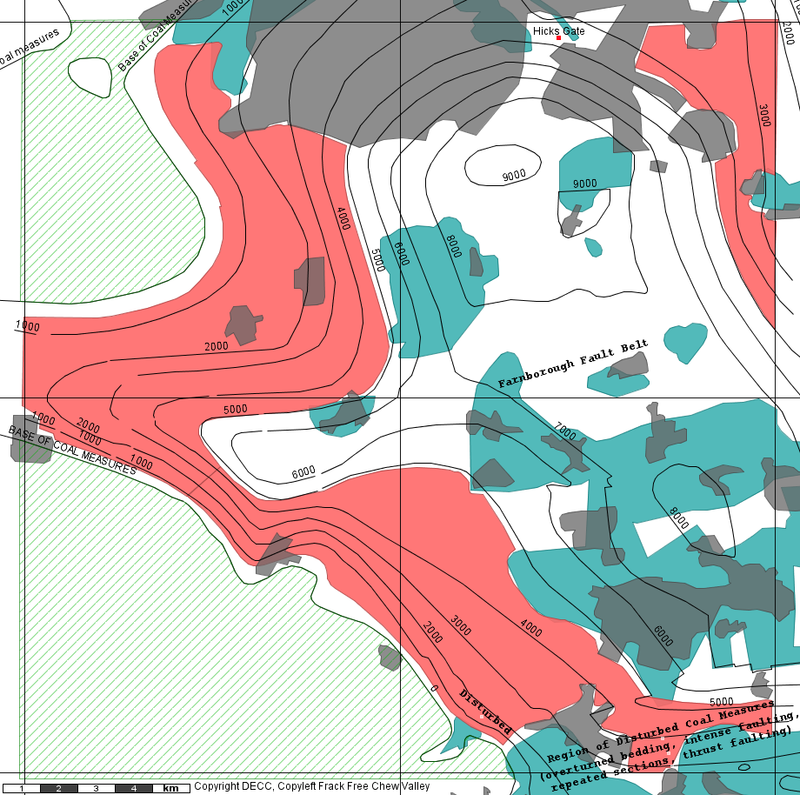 GeoMet compiled a map of the depth to the base of the coal measures, shown below. The contours are in feet and represent an underground surface across the licence. The green hatching in the figure are places where there are no coal measures. 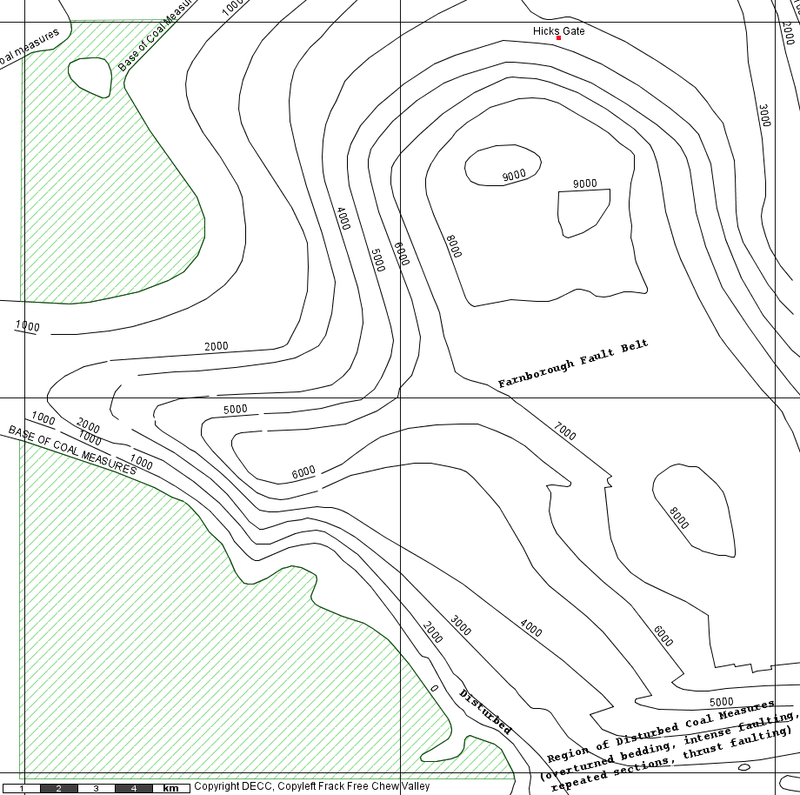 GeoMet’s Contours to the base of the coal measures in feet. Note that the exact location of these contours is fairly imprecise. Click to enlarge. In the past the upper coal measures have been heavily mined for their coal. GeoMet’s CBM Spatial Criteria. 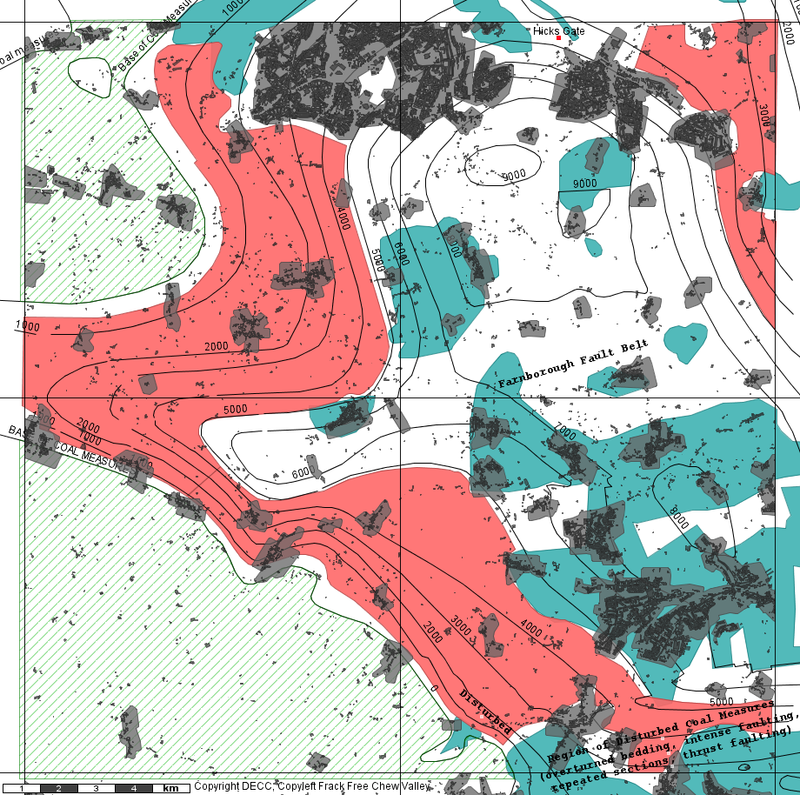 No coal measure in green hatch, mined areas in cyan, urban areas in gray, contours to the base of the coal measures in black, the prospective area between 500 and 5,000 feet in pink. Click to enlarge. GeoMet ignored all of the villages and hence people in rural areas, a better indication is provided by Ordnance Survey data. Click to enlarge. Hypothetical distribution of potential gas wells in the prospective area according to GeoMet’s specifications. Parish and Westminster Constituency boundaries also shown. Click to enlarge. NB that the location of the wells on the above map are of a hypothetical but indicative scenario if the prospective area were fully developed. The spacing of wells on this example is as specified by GeoMet but their exact location is arbitrary. The points A and B on the map are locations where GeoMet suggested drilling test bore holes. 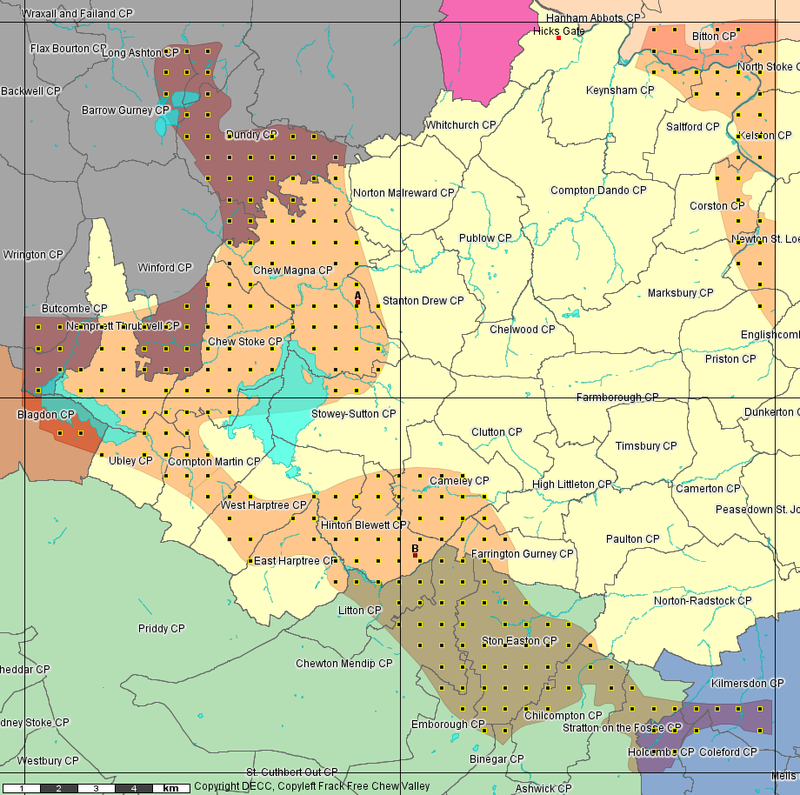 Parish boundaries are shown and the background colours represent the Westminster electoral constituencies. 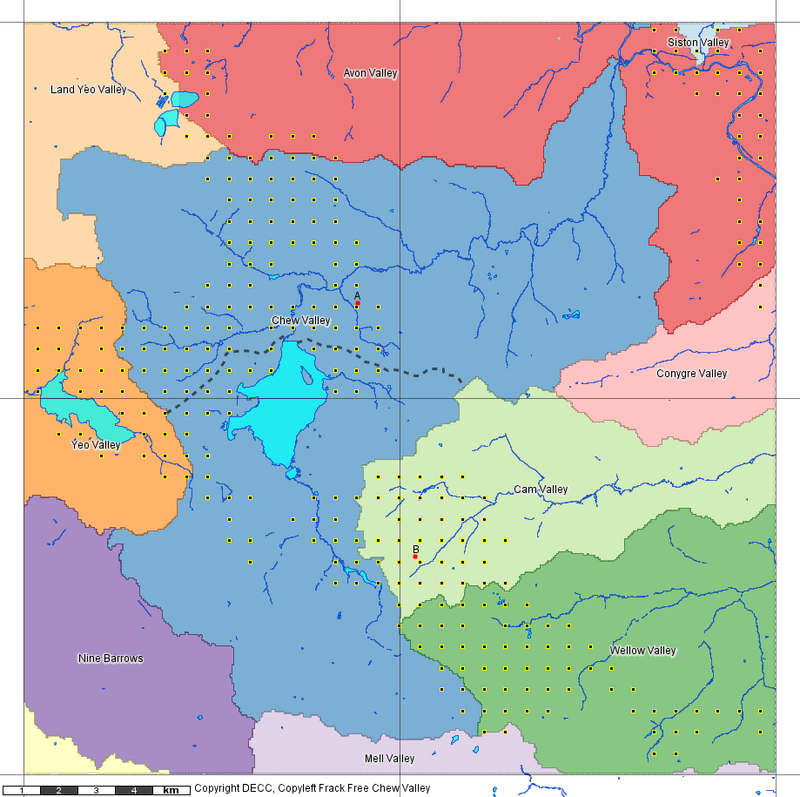 The figure below illustrates the distribution of hypothetical CBM gas wells in relation to drainage catchments and in particular the two major potable water reservoirs in the area which supply Bristol a city of 400,000 people. Potential Wells In Prospective Area By River Catchment. Click to enlarge. Frack Free Chew Valley has written a report on the DECC/GeoMet information which can be downloaded here, this includes the original GeoMet report and reconstructed maps. All of the information in the report is derived from public sources. FFCV CBM Report. Click to download. © DECC “This information does not constitute legal, technical or professional advice. Neither the Department nor the licence operator accept any liability for any direct, indirect or consequential loss or damage of any nature, however caused, which may be sustained as a result of reliance upon the information contained in this report.” The same goes for Frack Free Chew Valley.